Three days/two nights at a central London hotel with English breakfast, including return rail from your local mainline train station with reserved seats and guaranteed tickets for the show of your choice. The award-winning musical is returning to Theatre Royal Drury Lane with a fresh production led by Mark Bramble. 42nd Street is a classic musical following the journey of a talented unknown who sets out to be a star. Featuring an outstanding soundtrack, with songs including We’re in the Money and Lullaby of Broadway the 50+ cast set the stage alive. Fresh-faced Peggy Sawyer arrives in New York from small town America hoping to become a star. With a small chorus role in Broadway’s newest star Peggy isn’t going anywhere fast, but when the show’s leading lady gets injured it could be the chance for stardom that Peggy has always dreamed of. 42nd Street is an American production which first launched on Broadway in 1980, winning the Tony Award for Best Musical. The show then opened in London in 1984 and relaunched in Broadway in 2001, again winning a Tony Award for Best Revival. 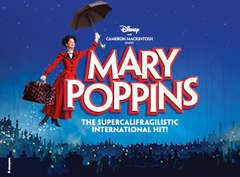 The latest production of the classic show on the West End features more songs and dances and a modern colourful twist. See a ‘whole new world’ with Disney’s Aladdin The Musical, the award-winning musical comedy and Broadway hit. Making its highly anticipated transfer to London’s West End at the Prince Edward Theatre, audiences can experience this world-class show in the UK capital, from the same producers as the hugely successful show The Lion King. Based on the incredibly popular animated feature, first released in cinemas in 1992, this Disney story is brought to life on stage – ready to sweep you into an exotic world with one rub of the magic lamp! Featuring a mix classic songs and new music, brilliant comedy, spectacular sets and timeless, Aladdin The Musical is a dazzling production people of all ages can enjoy. With a team of Tony Award winning directors, choreographers and writers including Casey Nicholaw, Alan Menken and Tim Rice, Aladdin The Musical has been seen by over a million people on Broadway, and was itself nominated for five Tony Awards. Sure to be a huge hit with the critics and audiences alike in London, Aladdin The Musical is simply not to be missed! Come From Away tickets are now available for the West End premiere of this moving tale of true events that transpired in the aftermath of the September 11 attacks. Following critical acclaim across North America, Come From Away is set to premiere in London in February 2019 following a run at Dublin’s Abbey Theatre. On September 11, 2001, 38 planes had to make unexpected landings in the small town of Gander, Newfoundland and Labrador. Come From Away tells the story of what happened when the residents of this small community struggle to accommodate nearly 7,000 ‘plane-people’ as they and the world are reeling in the days following the attacks. Come From Away tickets have been in incredible demand during the Toronto and Broadway runs of the production. Do not miss your chance to get tickets to this strictly limited run! At Bobbi's 35th birthday party all her friends are wondering why isn't she married? Why can't she find the right man? Why doesn't she settle down and have a family? One thing is for certain; you will fall in love with Company on the West End. Originally from Broadway, this London adaptation stars Rosalie Craig as Bobbi and Tony and Olivier award-winner Patti LuPone as Joanne. This musical masterpiece opens in September 2018 at the Gielgud Theatre for a strictly limited season. Following a sell-out run at Stratford-upon-Avon, Miguel de Cervantes’ classic tale comes to the West End stage for a strictly limited season at the Garrick Theatre until 2nd February 2019, Don Quixote stars David Threlfall in the title role with Rufus Hound as his hapless squire, Sancho Panza and is adapted for the stage by James Fenton and directed by Angus Jackson. Don Quixote by Miguel de Cervantes is considered one of the most popular works of Western literature ever published. Marking 400 years since Cervantes death, the 2016 RSC production at Stratford played to a packed Swan Theatre and received rave reviews from the critics. The original volumes were published by Cervantes between 1605 and 1615, originally titled “The Ingenious Hidalgo Don Quixote of La Mancha”. It was an instant success with the first English translation appearing around 1612 and several English works clearly inspired by the novel appeared soon after. Don Quixote has been adapted as an opera, a ballet and an orchestral suite as well as being produced for the big screen several times. Picasso and Dali produced artworks based on the story and two bronze sculptures of Don Quixote and Sancho Panza stand in the Plaza de España in Madrid. Glee star, Amber Riley stars in the show as she makes her West End debut. Playing the role of Effie, the American star has tweeted her excitement to be part of the London debut of the show. Set in 1960’s America, the era of R&B, Dreamgirls is the tale of a girl group from Chicago called “The Dreams”. The girls come across Curtis Taylor, a former used car salesman who wants to be their manager. Although the group finds initial success, rifts form in the band as Curtis tries to replace the current lead singer, Effie, with her best friend, Deena. Tony and Olivier Award-winning Book of Mormon and Aladdin director, Casey Nicholaw will direct the show, working alongside Friedman who will work as the show’s producer. With a book a lyrics by Tom Eyen and music by Henry Krieger, the show will highlight all of the classic musical numbers that made the production a hit on Broadway in 1981. Originally choreographed by A Chorus Line co-creator, Michael Bennett, the show will keep a vast proportion of the original dance moves. Dreamgirls includes iconic musical numbers such as “I Am Changing”, “And I Am Telling You I’m Not Going”, “Dreamgirls”, “Listen” and “One Night Only.” Fans of classic R&B and soul music will be blown away by the powerful vocals throughout the show which, judging by Glee, we know Amber Riley can deliver! As well as winning six Tony Awards in its opening year on Broadway, Dreamgirls was also adapted into a movie. The 2006 film, starring Beyonce Knowles as Deena and Jennifer Hudson as Effie, won supporting actress Hudson an Academy Award, with further nominations commending the show’s musical score. Don't miss out on your chance to see the incredible Dreamgirls at the Savoy Theatre this winter! *Amber Riley will play the role of Effie for 7 out of 8 performances per week. Currently the alternate will perform on Wednesday evenings. Sheffield Theatres’ critically acclaimed production Everybody’s Talking About Jamie transfers to the West End’s Apollo Theatre, following a smash-hit run at Sheffield Crucible. A brand new British musical by composer and lyricist duo Dan Gillespie Sells and Tom MacRae, the uplifting coming-of-age story finally arrives in London. After receiving multiple nominations at The Stage Debut Awards, Dan Gillespie Sells swiped the award for Best Composer, for the exciting score which includes numbers such as “Don’t Even Know It”, “Everybody’s Talking About Jamie” and “It Means Beautiful”. An uplifting, sensational story that is incredibly relevant today, Everybody’s Talking About Jamie plays at London’s Apollo Theatre from November 2017. Based on a true documentary, the musical follows sixteen-year old Jamie, who resides in a Sheffield council estate. Terrified about the near future and struggling to find his feet after his Dad leaves, Jamie finds it increasingly difficult to fit in at school. But Jamie is destined for something better, brighter and completely sensational. With the help of his ever-supportive Mum and friends, Jamie finds a way to overcome the prejudice and battle the bullies to step into the spotlight. A fearless, funny and fabulous musical about stepping out of the darkness, Everybody’s Talking About Jamie simply proves that dreams really can come true. After receiving multiple nominations at The Stage Debut Awards, Dan Gillespie Sells swiped the award for Best Composer, for the exciting score which includes numbers such as “Don’t Even Know It”, “Everybody’s Talking About Jamie” and “It Means Beautiful”. An uplifting, sensational story that is incredibly relevant today, Everybody’s Talking About Jamie plays at London’s Apollo Theatre from November 2017. In May 2018, it was announced that Everybody’s Talking About Jamie, the award-winning feel good new musical sensation, is to be made into a major film by Sheffield based production company Warp Films completing the fairy-tale journey from a 16-year-old approaching a documentary maker to hit West End Show and now the big screen. The multi-award winning musical from Andrew Lloyd Webber and Tim Rice returns to the London stage in 2019. Following two sell-out seasons at Regent's Park Open Air Theatre; where it won the Olivier Award for Best Musical Revival, and Evening Standard Award for Best Musical – Jesus Christ Superstar comes to the Barbican for just 60 performances from 4th July 2019. With lyrics by Tim Rice and music by Andrew Lloyd Webber; Jesus Christ Superstar is one of the West End’s most popular and enduring musicals. Originally running for more than 8 years in the West End, the show was revived in 1996 and again in 2012 for a tour of UK arenas. This latest revival looks set to be one of the hottest tickets in the West End in 2019. Jesus Christ Superstar follows the last week of Jesus’ life including his arrival into Jerusalem, his arrest and trial before Pilate and his crucifixion. The show features well-known songs including "Everything's Alright", "I Don't Know How to Love Him", "Gethsemane” and "Heaven on Their Minds". Originally written as a rock opera album starring Ian Gillan in the title role, Jesus Christ Superstar made its debut on the Broadway stage in 1971 before transferring to the West End the following year. It ran in London for eight years and went on to become one of the most enduring musicals of its time. Over the years the show has featured some of the biggest names in theatre and music including Paul Nicholas, Glenn Carter, Jérôme Pradon, Yvonne Elliman and Murray Head. The 2012 UK Arena tour starred Tim Minchin, Mel C and Ben Forster. The 2016 London revival won the Evening Standard Theatre Award for Best Musical and the Laurence Olivier Award for Best Musical Revival. Renowned as the longest running musical of all time Les Misérables London is the powerful story of ex-convict Jean Valjean and his attempts to re-enter into a society that has abandoned him. Set in 19th Century France amidst the struggles of the French revolution, Les Misérables the musical is a tale of passion, love and broken dreams. Les Misérables theatre breaks include an award winning score which includes the songs I Dreamed a Dream, On My Own, One More Day and Do You Hear The People Sing. Seen by more than 60 million people worldwide in 42 countries and in 21 languages, this spectacular adaptation of Victor Hugo's masterpiece continues to thrill audiences night after night. Geronimo Rauch stars as Jean Valjean with Tam Mutu as Javert. Celinde Schoenmaker will play the role of Fantine on Les Miserables theatre breaks. Please note that the performance schedule is subject to change without notice. A 360-degree dance and acrobatic spectacular. Made for a woman's gaze but directed at a woman's heart. Empowering and exhilarating. Whether you're looking for the perfect date night or an unforgettable girls night out, with this show, the woman is always on top. Limited capacity - be sure to book now! Matilda the Musical follows the story of an ordinary girl with extraordinary powers. Matilda Wormwood’s parents think she is nothing but a nuisance where as she thinks they care more about the TV than her. When they are not slouched in front of the telly, she is ignored by her mother in favour of ballroom dancing and by her father for dodgy business deals. At school Matilda life isn’t much better with the monstrous Miss Trunchbull terrifying the students and teachers, that is until one day Matilda discovers her powers and decides the grown ups need to be taught a lesson. In 1996 the fantastic story of Matilda was adapted into a film and now the stage adaptation is taking the theatre world by storm. Matilda the Musical is recommended for a general audience. As an advisory to adults who might bring young people, the show is suitable for ages 6 and up. All persons entering the theatre, regardless of age, must have a ticket. Following an incredibly popular run on Broadway, Motown: The Musical is the explosive new musical set to hit London’s West End. Sure to be the most soulful show on the London stage, this production is one of the most hotly-anticipated for 2016. Set to much-loved hits from the Motown era, follow the unlikely success story of once anspiring boxer and Motown record label founder Berry Gordy as he discovers talents like Smokey Robinson, The Supremes, Marvin Gaye and Michael Jackson. With a story spanning a number of decades, the audience will discover the truth of Motown’s rise to fame, and the personal dramas behind the soundtrack of a generation. Coming to the London Coliseum in summer 2019, On Your Feet is the story of Gloria and Emilio Estefan’s journey from Cuba to Miami and from there to stardom. Transferring to the West End from Broadway for a limited run from 14th June to 31st August 2019, On Your Feet features some of the most iconic pops songs of the era, including 'Rhythm Is Gonna Get You', 'Conga', 'Get On Your Feet', 'Don't Want To Lose You Now' and '1-2-3'. Gloria Estefan has sold over 100 million records worldwide, winning several Grammy awards during her 40+ year music career. Emilio Estefan is a founding member of the pioneering Miami Sound Machine, who created a brand new Latin crossover sound - fusing infectious Cuban rhythms with American pop and disco. Boasting an all-star cast, Rip It Up recreates the sights and sounds of the 60s on the West End stage. Rip It Up combines song, dance, acrobatics and visuals to bring the 60s vividly to life. Starring Aston Merrygold from JLS, Jay McGuinness from The Wanted, Harry Judd from McFly and Olympic champion Louis Smith, Rip It Up also boasts an incredible supporting cast of dancers, singers and musicians. Following up from the success of “Rip It Up - Dancing Through The 50s”, Rip It Up is now bringing the soundtrack of the 60s to London. The show also celebrates the decades momentous moments and figures including the moon landing, the assassination of JFK and the building of the Berlin Wall. Want to learn more about the stories of Henry VIII's wives, set to an infectious pop rhythm? Now's your chance! Head to the Arts Theatre in London for a truly unique experience like no other with SIX. DIVORCED. BEHEADED. LIVE IN CONCERT! From Tudor queens to pop princesses, the six ill-fated wives of Henry VIII finally take the mic to tell their tales, remixing five hundred years of 'her-storical' heartbreak into a 75-minute celebration of sisterly sass-itude. Following last year’s sell out pop-concert musical, SIX returns triumphantly to the Arts Theatre in London, powered by an all-female band. A brand new musical is coming to Theatre Royal Haymarket in December 2018. Produced in association with members of Take That, the stars were chosen on BBC1's hit show, Let It Shine. With music and lyrics by Gary Barlow and written by theatre favourite Tim Firth, The Band is a must-see for all fans of Take That. The story follows five friends who, back in 1992 were obsessed with "The Band" and are now 40-something women. They once again try to fulfill their dreams and meet their heroes. The Band features the songs of Take That and is created in association with all five members of Britain’s most successful band. The musical is not based on the story of Take That and the original members of the band will not appear in the show. Gary Barlow and Tim Firth collaborate again on a new musical featuring the music of legendary British boyband, Take That. The stars of the show were chosen on the BBC1 talent contest Let It Shine. Since Take That formed in 1990 they have enjoyed massive UK chart success including 28 top 40 singles, 12 number ones and seven number one albums. Tony Award winning show, The Book of Mormon Musical is heading to the Prince of Wales Theatre this year after roaring success on the stage in 2011. Guests can enjoy hilariously funny The Book of Mormon theatre breaks, brought to the stage by the Emmy Award winning creators of hit series, South Park. The musical follows two young Mormon missionaries sent to convert an African village and satirises everything from religion to The Lion King. The mismatched pair end up as far away from their home of Salt Lake City as you can imagine, as audiences watching raucous comedy, The Book of Mormon Musical, see their trials and tribulations unfold. The show romped to the top of the 'hardest ticket to find' list last year after winning nine Tony Awards including Best Musical, and opened this year's Tony Awards ceremony. Gavin Creel and Jared Gertner playing Elder Price and Elder Cunningham. The Comedy about a Bank Robbery is a Mischief Theatre production that has taken over The Criterion Theatre in London’s West End. The smash-and-grab play is a light-hearted and hilarious story about a town where everyone is a criminal. Receiving rave reviews everywhere, this play written by Henry Lewis, Jonathan Sayer and Henry Shields is set to be one of the best comedies in the West End. Set in the summer of 1958, an invaluable diamond has been left in the hands of the Minneapolis City Bank, unfortunately, this diamond is in high demand. With an escaped convict on the loose, the fate of the gem doesn’t look too bright. With the help of his wacky sidekick, trickster girlfriend and anyone else he can persuade, the play follows a path of lies, cheats and mistaken identities. In a town where no one can be trusted, the outcome is uncertain. Disney’s The Lion King Musical is a stage adaptation of the spectacular film which transports you to the Serengeti Plains with the moving rhythms of Africa. Join the touching story of young lion prince Simba as he starts his epic journey to become the King of the Pride Lands with help along the way from friends Timon and Pumbaa. After the birth of Simba to King Mufasa and his Queen Sarabi his evil uncle Scar hatches a plan to kill both Simba and Mufasa and proclaim himself as rightful King. Scar tells Mufasa that Simba is trapped and in need of help, Mufasa rushes to rescue his son, but is caught up in a stampede of wildebeests. Simba believing his fathers death is his fault flees the kingdom leaving Scar to reign over the Pride Land. Guests on The Lion King theatre breaks follow Simba as he grows up and decides whether to return to the kingdom which has been almost destroyed believing he is to blame. This wonderful show is complete with giant giraffes and antelopes and many more animals brought to life by striking puppets and special effects. The Lion King is recommended for ages 6 and above. Set in a country hotel recently opened by a young couple, the hoteliers and their five guests become snowbound one evening. Soon a policeman, Detective Sergeant Trotter, arrives to tell them that a murderer is on the loose and is heading straight for them. Sure enough, one of the party soon falls foul at the hands of the murderer. Who was the killer? Suspect everyone. The Brilliant Original: The Phantom of the Opera celebrated its 25th Anniversary with three spectacular sell-out performances at the Royal Albert Hall in October 2011.Now in its 30th record-breaking year, this multi-award winning musical continues to captivate audiences night after night. Renowned across the globe The Phantom of the Opera is the world’s best selling musical. Discover the Gothic tale of love and destruction in the heart of the Paris Opera based on the 1911 novel by Gaston Leroux on a The Phantom of the Opera theatre break. When the lead soprano of the opera refuses to go on stage through fear of the mysterious opera ghost, chorus girl Christine Daaé gets her opportunity to shine. Triumphant on the stage she returns to her dressing room to be congratulated by childhood friend Raoul, confiding in him that it is the Angel of Music who has taught her. Fraught with jealousy the Phantom of the Opera appears to Christine and takes her to his lair across the lake beneath the Opera House. Struggling with his love for Christine and determined that she will sing the lead in the opera for him the Phantom wreaks havoc on any that try to halt his plans. With powerful songs, striking performances and an astounding set, The Phantom of the Opera theatre breaks are a must for every theatre lover. The Phantom of the Opera London has won over 50 major theatre awards, including the 1986 Olivier Award and the 1988 Tony Award for Best Musical, and has been seen by over 100 million people. Opening at Her Majesty’s theatre in 1986 the Phantom has resided there since and has staged over 10,000 performances at that theatre alone. Guests on The Phantom of the Opera theatre breaks can currently enjoy Marcus Lovett as the Phantom, Simon Thomas as Raoul, Lara Martins as Carlotta with Sofia Escobar as Christine. Anna O’Bryne will appear as the alternative Christine. Please note, cast members cannot be guaranteed for every performance. The Play That Goes Wrong, a farcical comedy that has enjoyed vast success, first as a hit Fringe show and most recently on an acclaimed tour around the country, finally returns to London and the West End. Described as a comical hybrid of Fawlty Towers and Michael Frayn’s seminal meta-theatrical comedy Noises Off, this production has proved an astoundingly popular show, with hysterical performances and superb timing. When the Cornley Polytechnic Drama Society attempt to stage a 1920s murder mystery play, nothing goes right; prop doors don’t open, sets come crashing down and tempers flare in this brilliantly-observed farce. The winner of this year’s Whatsonstage award for Best Comedy, The Play That Goes Wrong has been lauded by critics and audiences alike. David Suchet will be returning to the work of Arthur Miller after his award-winning performance in All My Sons. He is joined by Brendan Coyle, Adrian Lukis, and Sara Stewart in The Price which is due to open at Wyndham’s Theatre on 5th February 2019. David Suchet stars as furniture dealer Gregory Solomon with Brendan Coyle playing opposite him as New York police officer Victor Franz. 'David Suchet steals the show in Miller’s masterpiece…a blissfully comic creation. The Price now emerges in Jonathan Church’s superbly acted production as one of Miller’s best plays' - The Guardian - 4 Stars. This 50th anniversary production of Arthur Miller’s richly affecting play, portrays his preoccupation with the pleasures and perils of the American Dream. Transferring from a sell-out run at the Theatre Royal Bath, where it was hugely acclaimed by critics and audiences alike, The Price is set to run until 27th April at the Wyndham’s Theatre in London’s West End. The Price was written by Arthur Miller in 1968 and has been performed several times on Broadway and has also been adapted for television. A high-octane, hit-filled musical, the sensational Thriller Live has been brought to the West End by the award-winning director Gary Lloyd and choreographer LaVelle Smith Jnr. The show acts as a brilliant musical tribute to the late King of Pop, Michael Jackson. With an incredible, pop soundtrack including well-known hits such as ‘Man in the Mirror’, ‘Billie Jean’ and ‘Thriller’, it’s a musical which is bound to have audiences up on their feet. With a musical career spanning over 40 years and selling over 750 million records worldwide, the Thriller Musical celebrates the legendary career of the King of Pop, Michael Jackson. Thriller - Live brings to life the distinctive dancing and sounds of Michael Jackson's greatest hits and pays a tribute to his career from his time in Jackson 5 to his solo career. Thriller – Live first previewed at London’s Dominion Theatre in 2006 before premiering in the West End in 2009 at the Lyric Theatre in Shaftsbury Avenue, with a host of celebrities attending the opening event including Tito Jackson, Vanessa Feltz and Nicholas Hoult. Featuring her much-loved songs, TINA, The Tina Turner Musical is written by Olivier Award-winning playwright Katori Hall and directed by the internationally acclaimed Phyllida Lloyd. Don’t miss this world premiere, opening at London’s Aldwych Theatre in Spring 2018! Cirque du Soleil was founded in 1984, by two former street performers from Montreal, Canada and has since gone on to become the largest theatrical producer in the world. Their shows have been seen by over 90 million people and have toured the globe as well as enjoying permanent residencies in Las Vegas, Mexico, Tokyo, Macau & Los Angeles. Kit Harington (Game of Thrones) and Johnny Flynn (Beast, Genius) star as warring brothers Austin and Lee in the West End Premiere of Pulitzer Prize-winner Sam Shepard’s funny, modern classic, True West. True West follows the story of Austin; a man working on a movie script that he has sold to producer Saul Kimmer. However, when Lee suddenly stumbles back in to his life he pitches his own idea to Kimmer, an action which has far reaching consequences… The critically-acclaimed drama, which is set in the Californian desert, pits brother against brother as a family tears itself apart, exposing the cracks in 'the American Dream'. True West was written for the stage by Sam Shepherd, and is directed by Matthew Dunster. Be sure to catch it at London's iconic Vaudeville Theatre while enjoying the best of what the capital has to offer. Wicked the Musical first took the world by storm back in 2003 when it hit Broadway and has been leaving London audiences spell bound since 2006. Guests on a Wicked theatre break can see the magic for themselves at London’s Apollo Victoria Theatre, which has been home to Wicked the Musical ever since it’s grand opening in September 2006. Wicked the Musical tells the incredible story of an unlikely friendship of two very different girls and their extraordinary adventures in Oz. One is blonde and popular the other is green and misunderstood and after meeting as Sorcery Students they embark on a journey that will change their lives. Following an encounter with The Wonderful Wizard of Oz, their friendship reaches a crossroads and the girls take very different paths. One is seduced by power and the other remains true to herself as they ultimately fulfil their destinies as Glinda The Good and the Wicked Witch of the West. This stage adaptation features music and lyrics by Stephen Schwartz as well as incredible performances from Rachel Tucker, Gina Beck and Matt Willis, amazing scenery and powerful songs. Wicked the Musical is the unforgettable untold story of Oz as never seen before. Wicked was the winner of the 2010 Laurence Olivier Award for most popular show and has been named the “Best Night Out” at the prestigious Evening Standard Theatre Awards in 2011. Wicked has also been nominated Best West End Show at the Whatsonstage.com Awards 2013. Evenings: Mon to Sat at 19:30. Lucy Bailey brings a new lease of life to Agatha Christie's monumental story about justice and betrayal. Set in the dramatic surroundings of London County Hall, it's sure to be an experience you won't forget in a hurry. Originally written by Agatha Christie, Witness for the Prosecution is now being performed in the dramatic surroundings of London County Hall. Audiences now have the chance to experience the intensity and drama of this classic tale of justice, passion and betrayal in a unique courtroom setting on London's Southbank. Celebrating over 20 years in the West End, The Woman in Black London perfectly combines the power of live theatre with a film noir inspired cinematic quality. Woman in Black London is a Stephen Mallatratt adaptation of Susan Hill’s best selling novel and has been described as one of the most thrilling, gripping and successful theatre events ever. Guests on a spine-chilling Women in Black theatre break will follow the story of a young junior solicitor Arthur Kipps who is sent to the funeral of Alice Drablow to sort out her papers. His task is a lonely one and he is completely unaware of the tragic secrets that lie within Alice Drablow’s home, Eel Marsh House. Filled with unease at the funeral Arthur catches a glimpse of a young woman dressed all in black and again later at the graveyard. Her wasted face and presence plays on his mind and he tries to find out who she is but with the locals not knowing or not willing to talk about her he must wait until she appears again and reveals her identity and her terrible purpose. It is estimated in its 20 plus years over 7 million people have seen The Woman in Black either in the West End or the many cities up and down the UK. First performed in Scarborough in 1987 The Woman in Black reached the West End in 1989 and has been attracting audiences ever since. With a selection of fantastic central London hotels to choose from, enjoying a Women in Black theatre break couldn’t be easier. Evenings: Mon to Sat at 20:00.